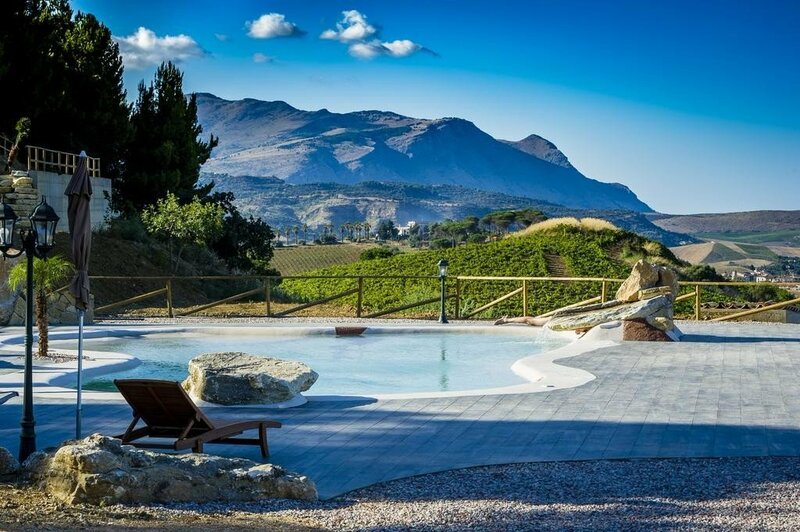 Agriturismo Antichi Granai is a scenic rural retreat between Palermo and Trapani in the depths of rural west Sicily. The hillside accommodation is that of a stylish and minimalist, traditional Sicilian farmhouse, the food is excellent, as is the homemade Nero d’Avola wine, and the hosts are enthusiastic, warm and welcoming. The have a choice of rooms and suites to sleep up to in the rustic farmhouse which dates back to the early 1900s. All of them are spacious and clean and come private bathroom, WiFi, air-con, central heating and lovely views of the surrounding countryside. Outside there are terrace and garden areas which are beautifully designed and maintained with plenty of lounging and al fresco dining space. There is a swimming pool in the gardens too and all around you can enjoy the same lovely views. There is a large working farm here too of course which you are more than welcome to take a look around, and do some horseback riding too. If you so wish, you can also join in some of the activities; harvesting the olives or wheat for example, or helping to collect some of the great array of vegetables and fruit which go in to the fine food at the farmhouse restaurant. Though just over an hour from Palermo and roughly half that from Trapani this agriturismo feels very much in the middle of nowhere. From its hilltop setting you have really tremendous views over the miles and miles of rolling hills that surround. There is barely a hint of urbanization in these parts with the exception of the picturesque little town of Calatafimi Segesta, so it will doubtless be a welcome break for many, especially if they’ve just arrived from Palermo. As a result it’s startlingly quiet and peaceful, with the stars at night appearing as bright as you can ever imagine. So it might be a place to relax but there is still a lot to do and see locally and the hospitable agriturismo owners can arrange all sorts of tours and excursions for you. You can arrange day trips to the city of Trapani, and to its surrounding, quite iconic, salt pans, to the famous 5th century B.C. Doric temple of Segesta, to the beaches and nature reserve in Scopello or to the stunning hilltop town of Erice. And not forgetting things like horseback riding and quad bike riding around the local countryside. The nearest town airports are of course at Palermo (Falcone Borsellino Airport) and Trapani (Birgi Airport) and shuttles to and from both of them can be arranged.